On a side note, Boating magazine’s swimsuit endeavor is as tastefully done, if on a smaller budget, as Sports Illustrated’s annual benchmark, and possibly more relevant (swimsuits make more sense on a boat than on a basketball court, don’t they?). And Boating magazine did a terrific job of coordinating their version with boat manufacturers. 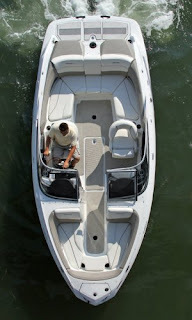 Each participating boat brand was paired with a model, who stars in a short video set on their appointed boat, with a boat review voiced-over by the magazine’s editor-in-chief Randy Vance. If nothing else, more men probably watched online boat reviews over the past few days than ever before. Question is, did anybody notice the boats? For pictures and full stories on all ten Eco Award winners, visit www.boatingmag.com/ecoawards. For pictures and videos from the swimsuit edition, visit www.boatingmag.com/swimsuit. Guess which link will get more clicks?